The extended cold snap in Minnesota may feel like bad news but there is an upside: it's killing off some of the insects that harm our trees and crops. MPR News' Phil Picardi spoke with Rob Venette about what bugs the cold is killing. Venette directs the Minnesota Invasive Terrestrial Plants and Pests Center at the University of Minnesota and is also a research biologist with the United States Forest Service. 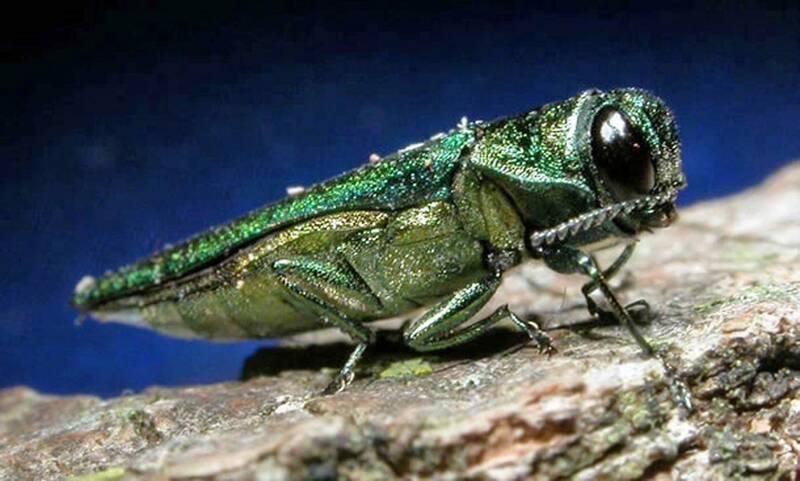 One of the big invasive species that people talk about in Minnesota is the emerald ash borer. Could this cold snap be good news for the state's ash trees? I think it really depends on where you are in the state. It's a mixed story in the metro where the invasion of the emerald ash borer really started. We've been seeing temperatures in the minus 16 range, and unfortunately those temperatures are not cold enough to cause substantial impact. We know that temperatures need to get down to around minus 20 in order to begin to kill that particular insect. When it gets to minus 20 we expect about 50 percent of the emerald ash borer to die. But when you get up into northern Minnesota, that's where those cold temperatures actually can begin to have an impact. When you're getting temperatures that are approaching minus 30 then we see about 90 percent of emerald ash borer are likely to die. What other invasive insects in Minnesota could be affected by this cold? There's a new insect that showing up in the state, the brown marmorated stink bug. It's actually been in parts of Minnesota since around 2010, but we're seeing populations build pretty consistently in the Twin Cities metro. That insect can only handle temperatures around minus 2. So it's not a particularly winter-hardy insect but it has a unique biology in that it likes to come inside to spend the winter, much like the multicolored Asian ladybugs. I hear there's a fruit fly that's been bad for our berry crops. Is that going to be affected by the cold? That fly is the spotted-wing drosophila, and what we know is it's not especially cold hardy if it gets down to around minus 4. We expect about 95 percent of those insects to die, but this is an interesting insect in that it likes to find shelters — particularly underneath the snow. We haven't had a lot of snow in the southern part of the state, so we don't know if that kind of a protected environment is going to be available so there's a good chance that some of those insect populations will be set back. What about our old favorites — mosquitoes and ticks. Are they affected? They can be but they, too, have a long evolutionary history in dealing with the cold and so they're frequently looking for these protected environments. It's interesting if you have just 4 to 5 inches of snow the temperature beneath that snow pack stays right around 32 degrees, so 32 would feel pretty good compared to a day like today. Even if there is a die-off of some of these invasive species, won't they just come back in warmer years? They can, but the advantage is for the people who have to manage these insects. It helps to buy them time. And in many cases an extra season makes a really big difference in terms of the cost of management and how effective that management can be. Correction (Jan. 5, 2018): Rob Venette's name was misspelled in an earlier version of this story. The story has been updated.